Welcome to Month Four of A Prairie Gathering Quilt of the Quarter! Boy, these months are passing by so quickly....too quickly! 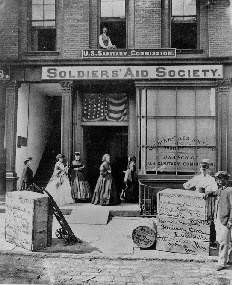 This month we begin a new quarter which means there is another historic story coming your way, and the subject this time is how nineteenth century women's contributions to many, many Soldier's Aid Societies made a lasting change, and helped untold soldiers in their time of need. It was so fun doing the research for this story, and I hope you enjoy it. Twenty First century women still bring aid and comfort to all of the folks in our Armed Services! Awesome!! Beginning with Month Four, you will also begin to get more fabrics from the Prairie Gathering collection, which means more to play with!! Always a good thing! Let's get started on what we're sewing this month. For the next three months, we will be doing a lot of sewing to make units all building up to start assembling those gorgeous pieced borders. I didn't want you to have to sew nothing but Flying Geese for a whole month, or Two Patches for a whole month...that would be boring. So, I mixed it up and mixed up the fabrics, too, to bring a little mix into our piecing. You'll be making more Flying Geese and will be playing with some of those new fabrics. You will also make the cornerposts for the Flying Geese border. The hints I have for cornerpost units are the same I have for making Flying Geese using the Connector Corner method. 1). Draw a diagonal line from point to point. That means that your pencil line should go from point to point. Don't position the ruler on the points as then your pencil will be slightly off center. It would be off enough to make a difference. 2). Position the Connector Corner square on the base. Be particularly careful when doing this. It seems like such a 'no brainer' thing, but can also make a difference. Take care to precisely position the light print exactly on the corner of the red square base so that the two corner edges are perfectly aligned. If you're even a little off 'center', it will effect the way the triangle is positioned. 3). Sew on the diagonal line. Actually, that is a misnomer as you should really sew a thread or two inside the seam allowance. This is the same effect as sewing a scant 1/4 inch, which allows for the threads lost when the fabric is folded over. Look at the square in the upper left corner of the photo. You can clearly see my stitches just a thread or two inside the drawn line. 4). Press, and then trim the Connector Corner. Actually, a lot of patterns instruct you to trim then press...never do it in that order!! Always press first, and then check to see if the triangle is completely even with the corner of the base. If it is, then trim both layers of fabric under your triangle...you don't need them, and leaving them in only adds to bulk, which robs you of accuracy. If the triangle is not a perfect match to the base... if it doesn't line up on the two sides, then unstitch those stitches...it's a small seam - not a lot of stitches to rip. Resew the seam (and you can easily do that because you didn't trim and then press!) so it's perfect. You'll be happy that you did when you get beautiful points for your trouble!! You will begin to assemble Shoo Fly blocks this month, too! Fun, fun, and I love Shoo Fly blocks. They are often over shadowed by their cousin, the Churn Dash, or even confused that they're the same block, but they're not. (The Churn Dash has two squares instead of the light rectangle...a light and a dark square.) These are about as easy to assemble as a Nine Patch. Just sew them into rows, then sew the rows together. Easy, breezy!! Hope you enjoy your piecing this month, and I'll be back next month with more helpful hints while we make this journey together! 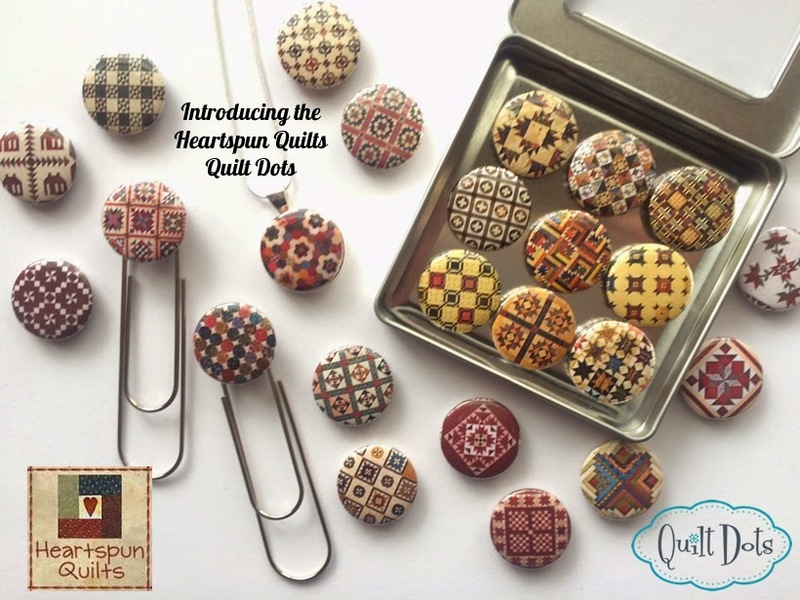 Heartspun Quilts ~ Quilt Dots!! of Quilt Dots. Aren't they fun?!! Quilt Dots are "buttons" that showcase quilts and quilt blocks. and swap magnetic Dots on a pendant for many different looks! gifts for all your quilting friends. Click here to order Heartspun Quilts Quilt Dots!! Just wanted to touch base with you all to chat for a quick minute on what's been happening in my studio this week, but first I must mention that today marks the 150th anniversary of the end of the Civil War. For all of us Civil War buffs, it is a very special anniversary indeed! Sad, too, that in just a short time, we will also mark the 150th anniversary of Abraham Lincoln's assassination. I'm just grateful he lived to see the end of that dreadful war, and pass the Emancipation Proclamation. I just had to take a moment today to reflect on the anniversary of these important events. My friend, Deb and I have been working like crazy people in the getting-ready-for-quilt-market-crush. We've been cutting, and sewing, and stuffing patterns to beat the band. Normal activity in April and May getting ready for the 'big show'. We have three quilts to make for my new pattern, Tokens of the Past: Nine Patch Reverie, and this block is one block in one of the quilts. Oh, I'm madly in love with these teeny, tiny pieces, and totally get that many of you are not!! No worries...the three quilts in Tokens: Nine Patch Reverie all have alternate sizes, so while I'm making mine as small as I can make them, there will be larger versions included in the pattern for your piecing pleasure!! Watch for more news coming soon, and you can see sneak peeks on my Instagram and Facebook pages. On a totally unrelated subject, I wanted to share something I have come to really enjoy. A few weeks ago, I was having dinner with my dear BFF, Lynn M, who is a wonderful photography enthusiast. A few years ago, Lynn began taking a picture of her family members, or dog, or flowers, or quilts, each and every day of the year to make what is basically "A Year In Pictures" of her families life. The photos are wonderful, casual remembrances of their daily life. Of course birthdays and anniversaries are well represented, as well as the simple stuff, like going to the movies, or the first day on a new job. Whatever is happening in her life, large or small, a simple snapshot is taken for her photo diary. Well, I loved the idea, but never followed thru. At dinner that evening, I asked Lynn if she was still keeping her photo diary, and she said yes, and she also shared this APP that she loves with me, and I immediately downloaded it, and began using it.....Love, Love, Love. So, I thought I would share it with you. The APP is called Collect, and it's FREE!! It is exactly the same concept as Lynn's photo diary only it 'collects' photos that you take with your phone. I could not be easier! Each day, the Collect App sends you a reminder to take a photo that day. You can give a title to the photo, and write a few notes on what was happening. I've been 'collecting' for about a month now, and already can't believe how much I have recorded of our family in just 5 minutes or less a day. Some days are more remarkable than others, like my daughter and husband's first day on a new job, but others are just candid pictures of me cooking our favorite Italian specialty, or my son on the floor playing with the dog. I've also taken pictures of my quilts in progress, and had to take a photo one morning when I opened the kitchen blinds and saw a rainbow. I was thinking about how cool this would be for new parents, or grandparents, to record every day of a new babies life! So easy, and what a keepsake!! Here's what the APP looks like, if you're interested. I know this isn't quilting related, but I hope you don't mind that I'm just passing along something that I really enjoy. I thought some of you might really like it, too. Thanks, Lynn, for passing this along to me. Next time we're together, I'll be adding your photo to my Collect journal that day!! Take some time to sew a few stitches today...you'll be sew much happier for it! Progress....sometimes it comes quickly, and sometimes it just seems to take soooo long. It always seems to take so much longer when you're in a hurry, don't you think?? Anyway...my Treenware and Berries quilt patterns are all finished. Click here if you'd like to order one for your stitching pleasure. The Tokens: Spice Box patterns are nearly complete. I'm just crossing the T's and dotting the I's on the pattern, and then it will be sent to the printer. That feels like good progress, too. Last week, I decided to move ahead on a pattern idea I've been ruminating over for quite some time now. 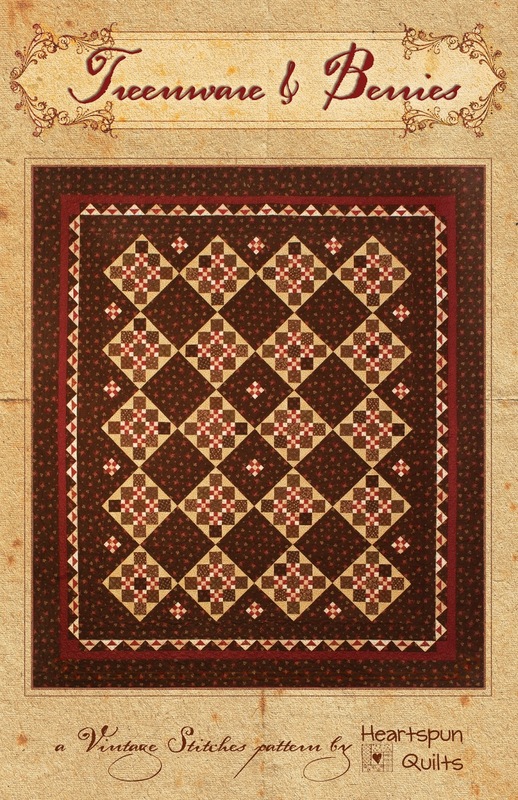 It's another Tokens of the Past pattern, with all of the quilts featuring one of my favorite blocks....the classic Nine Patch. Now, there are loads of wonderful Nine Patch quilt patterns out there already, and I aim to do something different, but still traditional, and I hope you'll like what's coming. I'll be posting sneak peeks on Instagram and Facebook, so you might like to watch for those posts. I'll be posting one later today. Really excited about these Nine's!! Thank you all for sharing your comments about how you organize your scraps, and the scrappy quilts you make. I love reading each one, and appreciate you taking the time to share your thoughts. It really means a whole lot to me!! 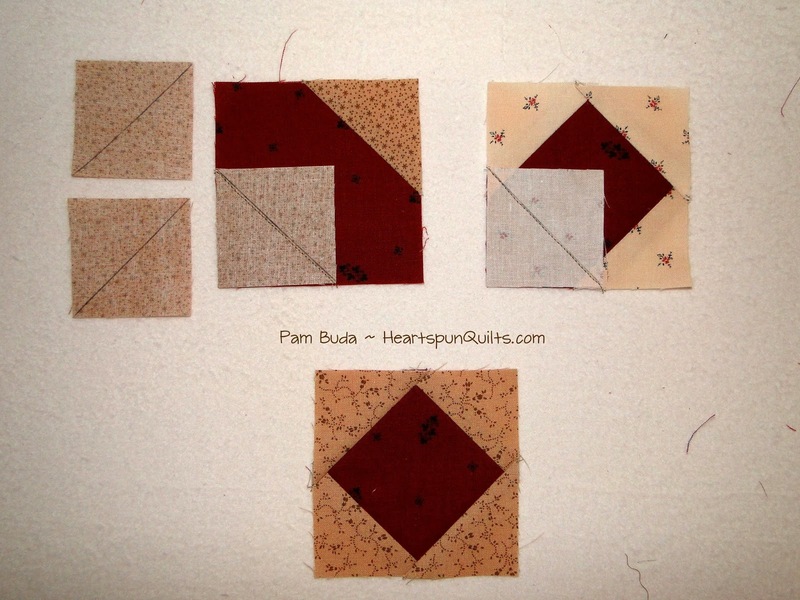 Right now, I am in the process of making scrappy log cabin blocks for a quilt. Sew, my box of scraps is quite low. How did I organize them, you asked. I DIDN'T ! Everything less than 2 1/2 inches was just thrown in a box. It worked for me but was a mess. Love the churn dash block and the way you made it scrappy. Very creative. I have a clear, plastic shoe holder (2 shoes fit in each pocket) hanging over the back of my sewing room door. I am able to tuck scraps in each of those pockets, sorting by color. When I need scraps or something for applique I need only check out what's in those pockets. When the pockets start to get full I pull them out and just assemble scrappy nine patches, four patches or string piece. Everything is there right in front of you to see! The scrappier the quilt the better ... I especially love those that have pieces of cotton shirtings stuck in here and there. Regardless of whether I win or not (though I would REALLY like to win one of the blocks) I plan to make this quilt ... LOVE the use of so many different fabrics in this classic block! I love your new quilt. I will be looking out for the magazine. I sort my scraps in containers similar to yours. I have 2 sets of containers. One set for squares and one for long strips. Each set is sorted by colour. It means a lot of containers but it makes scrap quilting so much quicker. 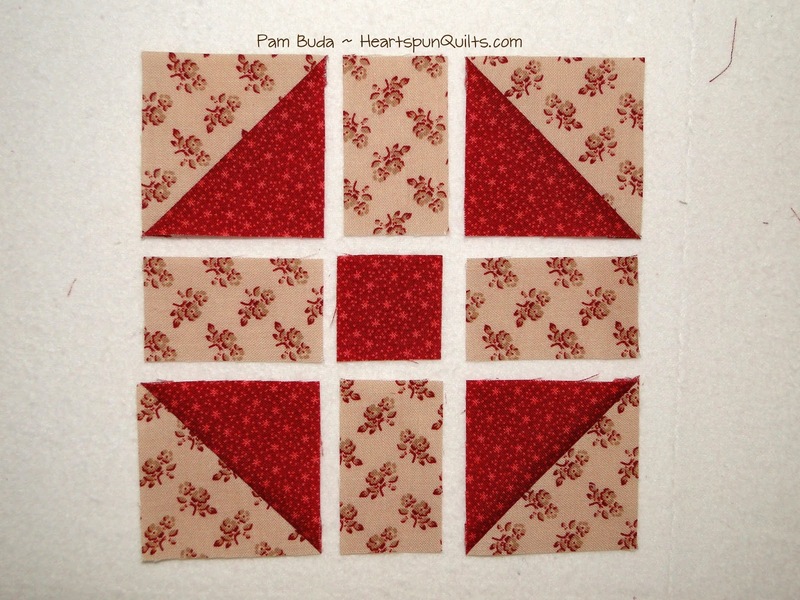 Please email your addresses to me at Pam@HeartspunQuilts.com, and I'll send your blocks out to you right away. Enjoy your weekend, and I hope you find some time to stitch!